How to choose a mountain bike tire: Tires are the only point of contact a bike has with the ground. Having confidence in them will allow you to ride on the edge of control with more assertion and let you hang it out in the fast stuff. Some good rubber can also help you scrape up those nasty climbs by giving you that extra bite right when you need it. Modern tires come in a wide variety of tread patterns and compounds designed for every terrain and weather condition imaginable. Although the wide selection can be daunting, upgrading to a model built for your riding style will have a positive impact on any ride and is worth shopping around for. Tires can be classified according to their intended riding style and whether or not they are designed for tubeless use. Downhill, cross-country, all-mountain and dirt jump/slopestyle tires are all designed to excel in their respective disciplines. Most tire types are available in tube and tubeless versions. Downhill tires are the widest, ranging from 2.3 to 2.7 inches. They usually use soft rubber compounds, have large knobs for the most traction, are equipped with thicker sidewalls to resist punctures, and are the heaviest tires. Cross-country tires are the lightest of the bunch, with thin sidewalls, small knobbies for fast rolling characteristics and a folding bead to further reduce weight. They are between 1.8 and 2.25 inches wide. All-mountain tires hover between the two, ranging from 2 to 2.4 inches wide. They come in many styles and tread patterns depending on how aggressive riders are. Dirt jump/slopestyle tires, designed for smoother terrain, use less extreme tread patterns to reduce rolling resistance and facilitate carrying speed. Tire sizing is based on two numbers, usually inscribed on the sidewall, that denote the diameter of the tire and its width (ex: 26 x 2.5 inches). There are three available diameters for mountain bikes, depending on the size of your wheel: 26 inch, 650b, and 29 inch. Normal tire widths range from 1.85 to 2.7 inches. Not surprisingly, a tire's exterior layer tends to be made of rubber. Underneath the rubber lies the bead, which is the lip that rests upon the rim and keeps the tire in place. Beads are available in either wire or foldable options. Extremely lightweight, entirely kevlar tires are also available for cross-country, dirt jump, slopestyle applications. Shopping for tires can be a fun and easy process if a few important things are kept in mind - the rubber compound, tread pattern and weight. The rubber compound, measured by the durometer, indicates how soft or hard the tire is. Durometer ranges from extra soft 40a compounds to standard tires, which have a durometer of 60a. Soft compounds offer great grip, but give up some longevity because they tend to wear faster - these are popular with downhillers. Tread patterns are designed specifically for types of terrain and riding styles. 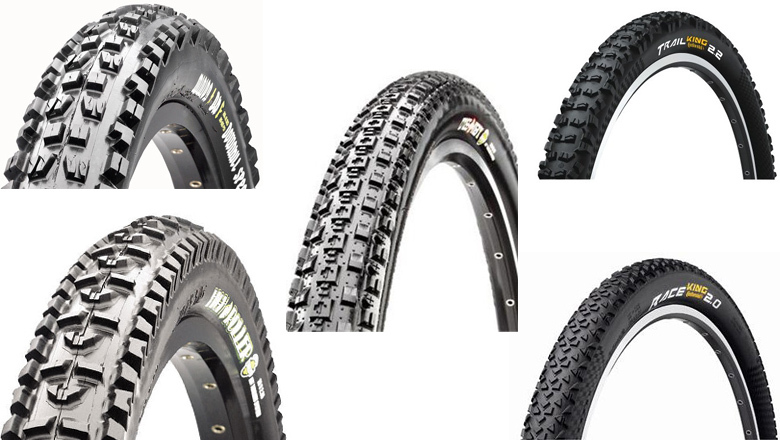 There are more aggressive patterns for freeride and downhill applications, narrower tires with small knobbies for cross-country riding, all-mountain tires that fall somewhere in between and semi-slick or slick tires for riding on smooth surfaces. Tires are also a great place to save weight. Simply switching to a lighter pair can drop your total bike weight significantly. Reducing "rotational weight" is an easy way to make a bike feel faster. Tires range in price from $15 to $140. Models in the $15-$60 range are generally wire bead, hard compound models designed for longevity. They are available in every width, size, and style of tread, but may not offer the low weight or grippy performance of more expensive tires. Moving up to the $60-$140 range, tires become available with lightweight foldable beads, sticky rubber compounds and tubeless compatibility. Tires in this range are a worthy investment for any serious rider looking to get more control out of their ride.